On 26th April 2013 I was invited to deliver a presentation to the Italian Club’s meeting at the RCS. 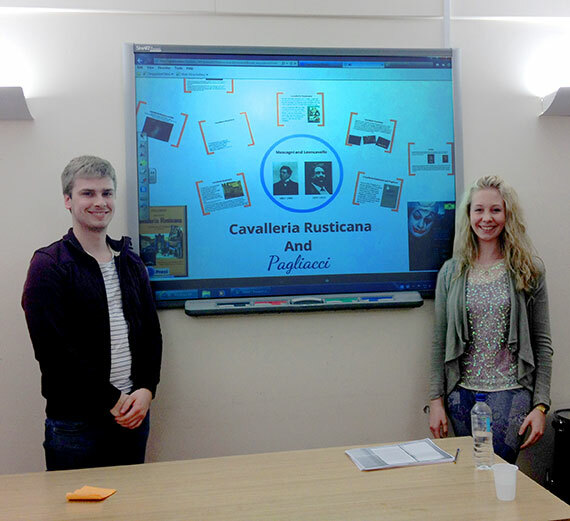 Marcus Kitchen and I held a 45 minute talk and discussion revolving around early 19th Century Italian opera focusing on Ruggero Leoncavallo’s opera ‘Pagliacci’ and Pietro Mascagni’s opera ‘Cavallria Rusticana’. We explained that during this period the opera attempted to represent the working class man, it moved from the grand lavish houses of the aristocracy in order to enable the music to be the people’s opera. They also shortened operas to one act. As opera didn’t remain this way I wonder why this alternative format failed to gain the momentum of support needed to carry it through to modern day audiences, this will require more investigation. This entry was posted in Education, Lifestyle, Music and tagged classical music.